This is a really good deal, so you should head out early to get the hair products you want - You will make $5! Woo Hoo! 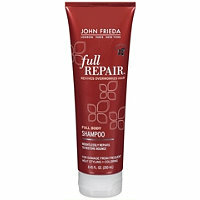 Buy 3 John Frieda products, get a $5 Target Gift Card. Final Cost = 3 for Free + 3¢ overage and $5 Gift Card! There are many other deal combinations with this, but this one will get everything completely free plus the Gift Card. If you figure any other Free scenarios, let me know!